He ran for Scotland in the 1983 World Junior XC Championships; and later that year, Shettleston’s 7th place in the E to G secured ‘most meritorious’ medals. A very good track runner as evidenced by the times noted, he also turned out for his club over the winter season and was virtually ever present in their Edinburgh to Glasgow team throughout the 1970’s, particularly on the tough second stage, and was a member of the team that won the medals for the most meritorious team performance in 1974. In the 1980 and 1981 Scottish Junior National XC championships, Colin was in two winning ESH teams; his best individual position was 6th in 1981. He ran the E to G in 1980, when they finished 4th. Dave was a real character, who enjoyed many adventures, especially with HBT. In the E to G, with EU, he won a bronze medal in 1969; and ran twice for EAC in 1970 (4th) and 1971 (5th). In the 1968 Junior National XC, for EU, his team finished third. In the Senior National XC, for EAC, he contributed to team bronze in 1971 and silver in 1972. However he was a stamina runner and in 1984 finished an excellent second (5 hours 24 minutes and 37 seconds) in the gruelling Edinburgh to Glasgow 50 miles ultra-marathon, behind Don Ritchie but in front of Colin Youngson. In 1957, he ran well on Stage 3 for the VP team which won the E to G; and ran they finished third in 1958. In 1987 and 1989, Rob won two bronze medals for AAAC in the E to G. Then he ran the great race 8 times for Metro, including 5th place and the ‘most meritorious’medals in 2001. After that, Rob enjoyed a long, successful career as a veteran athlete. 880y: 1:55.9 1963; Mile: 4:09.5 1962; Two Miles: 9:06.0 1966; Three Miles: 13:51.2 1961; Six Miles: 29:02.0 1967; 10 Miles: 49:53.0 1970; Marathon: 2:19:28. A good runner as a youth and a junior who never quite made it as a senior although he ran well in championship teams and in the Edinburgh to Glasgow. Neil Tennant was a top class runner with real talent who raced in and for Scotland with distinction all through the 1980’s. Most unfortunate not to win selection for the 1986 Commonwealth Games in Edinburgh he continued to attend Scottish squad days, to run for Edinburgh Southern Harriers in all the races that mattered and to represent Scotland when called upon. Charlie has been a familiar figure on the Senior and now veteran scene in Scotland for almost 30 years now and although never an elegant easy striding athlete like some of the track stars, he has had a record of consistency of running at a high level that is probably unrivalled in Scottish endurance running. Charlie has a wonderful collection of medals for road and cross country running – 13 Gold, 4 silver and one bronze for the national. 1 gold, 5 silver and 3 bronze for the E-G, 3 gold, 3 silver, and 6 bronze for the six stage relay. He was always better on the country and his record of consistency there is quite amazing: in his first twenty years as a senior his placings in the National Cross-Country Championships were as follows: 26, 20, 18, 20, 27, 12, 37, 18, 33, 17, -, 29, 12, 16, 12, 26, 18, 13, 29, 18. Not a Scottish International, his best running came too late for the World Championships, never in the first ten, but – ten times out of 20 inside twentieth position, only two lower than twenty ninth and none at all as low as fortieth! Jim was a much better athlete than his record indicates. Jim was an outstanding talent as a youngster, perhaps did reach the same heights at senior level. eg won District U13 twice , won under 15 and under 17 District Championships; in the national he won at U13, had two thirds at U15 and had a second at U17. On the track he won the SAAA U17 1500m twice (4:05.2 and 4:05.4) in 1971 and 1972. 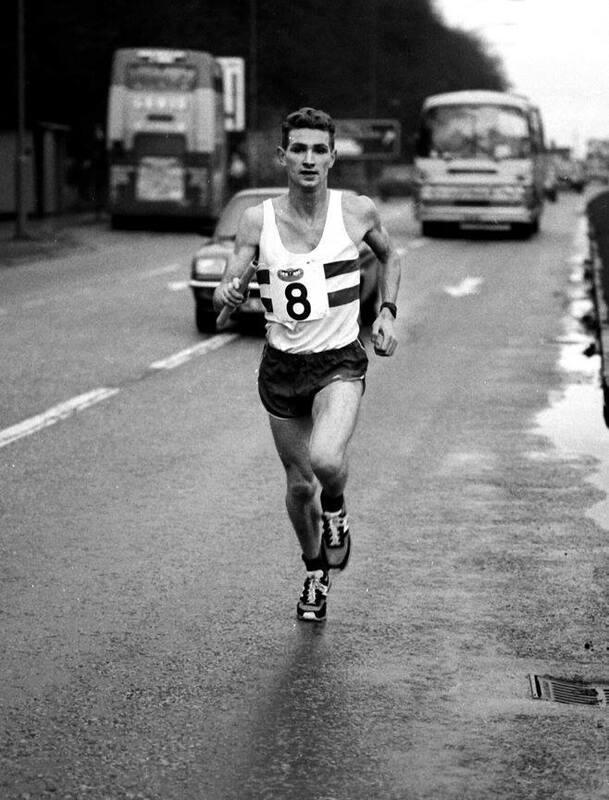 As a senior, he ran alongside such good runners as John Myatt and Doug Frame in several E – G relays and national championships as part of good teams without reaching the individual standards of his earlier years. .
Joe was a consistently good Scottish Marathon Club long-distance road runner. 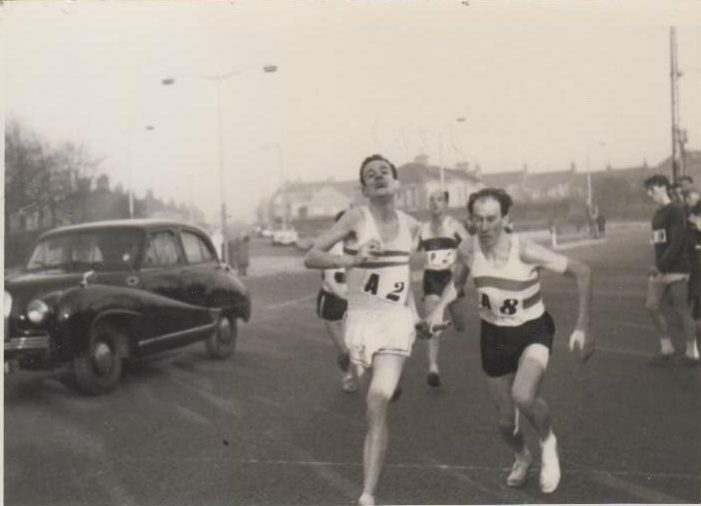 He won the 1956 Babcock and Wilcox 15 Miles; and that year was also second in the Brechin 12. In the Ben Nevis Race, Joe did very well: 7th in 1954; 5th in 1955; and 14th in 1956. In 1955, “Glasgow and District B” – Joe 5th, Pat Moy 7th and Stan Horn 8th – finished First Team in this gruelling event. He was well known and highly respected locally as a good individual and team runner who supported his club enthusiastically. Given that it is ironic that the Glasgow and District B team mentioned above had three Dunbartonshire runners – Pat Moy from Vale of Leven and Stan Horn from Garscube. It is even more interesting that Joe defeated Scottish internationalist Moy. Tommy had been a runner for Falkirk Victoria who went on to become club coach, in which capacity he worked with many well known athletes including Willie Day. Willie was one of a family of distance runners with his father, brothers and son all being good club runners. 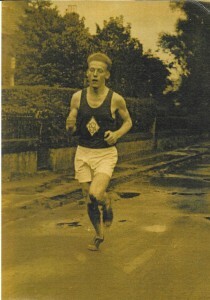 Ian was a familiar runner in most races, particularly on the roads of Scotland in the 1970’s – the 2:25 marathon time indicates that he was a bit above average but unfortunately he was a member of an Edinburgh AC team when it was blessed with many international endurance runners which made it difficult to break into the top team. Like Jim Thomson, Alan ha an excellent career in the younger age groups – As an U13 he won the District Championships, as an U15 he had two second places and also finished third in the national championships. 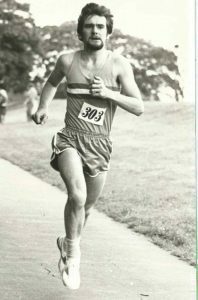 He was then sidelined for a bit and returned as a senior in the 1970;s where, although he ran well and represented East Kilbride AAC in cross-country, road (including the E-G) and track he did not quite reach the standards of his younger years. In the 1955 E to G, John was fastest on Stage 5 and his team won the race. Previously he had won silver medals in 1952, 1953 and 1954, when he was also fastest on Stage 5. In the 1950 Junior National, he was in the Shettleston team which finished second. In the Senior National XC, he added team bronze in 1956. Don Turner was a good marathon runner, who finished third in the SAAA marathon in 1968, and an excellent ultra marathon runner who won the first Two Bridges race by 7 minutes from Hugh Mitchell of Shettleston. Tom came into the sport as a senior athlete having previously been an amateur footballer. He proved to be a natural athlete running all distances from 1500m to marathon, on all surfaces including road, country and track as bot a team and individual medallist. He ran in all the team races that mattered: the Edinburgh to Glasgow Relay several times in the early 1980’s, the National Road Relay championships, and the National Cross Country championships. He contributed to team gold medals in the 1986 Six Stage Road Relay and bronze in 1987; and E to G silver in 1986. It was a loss to his club when Tom moved back down to England.